Many solar installers advertise solar leases or power purchase agreements (solar PPAs) as an easy way to reduce your electricity bill. If you are interested in a simple, low-maintenance option for installing a solar energy system on your home, leasing solar panels is a good option for you. You have many solar lease and solar PPA options available to you. Many are $0-down agreements, but some require a down payment or ask you to pay upfront. You can expect 10-30% savings over the cost of your utility electricity bill. With a solar lease, you do not own the solar panel system on your property. If you sign a solar lease or solar PPA, the tax credits and other financial incentives belong to the owner of the system (not you). The EnergySage Solar Marketplace can help you find and evaluate your solar lease and PPA options, as well as high quality pre-screened solar installers. How do solar leases and solar PPAs work? Solar leases and solar PPAs are similar to renting your solar panel system. You enter into an agreement with the solar leasing company that entitles you to the benefits of the system (i.e., the energy that the solar panels generate) for the term of the contract, which is generally around 20 years. Under these arrangements, the solar leasing company owns and maintains your solar panel system, so it is entitled to the rebates, tax breaks, and financial incentives that are available for the solar panel system. Consumers can indirectly benefit from those savings through lower electricity rates. The structure of your agreement will vary slightly depending on the type of solar lease/PPA you choose. Solar leases and solar PPAs come with $0-down, prepaid, and custom down payment options, and are available to consumers in about 25 U.S. states. Lease and PPA terms vary greatly by state and by installer, so explore multiple options to ensure that you choose the financing choice that best fits your needs. Solar leases and solar PPAs: what's the difference? While the terms “solar lease” and “solar PPA” are used interchangeably on this page, and are very similar in practice, there is a key difference between the two. With a solar lease, you agree to pay a fixed monthly “rent” or lease payment, which is calculated using the estimated amount of electricity the system will produce, in exchange for the right to use the solar energy system. With a solar PPA, instead of paying to “rent” the solar panel system, you agree to purchase the power generated by the system at a set per-kWh price. Solar lease agreements and PPAs can appear more complicated than a solar loan or cash purchase because of the additional terms that are included, but they generally provide lessees with flexibility in the event that their circumstances change. Term length: Residential solar leases are usually for 20 to 25 years. Commercial solar leases can be customized, and generally range from 7 to 20 years. Performance & maintenance: The leasing company will monitor the system's performance to ensure that it is operating correctly for the duration of the lease. They are also responsible for maintaining and repairing it, although solar panels require little to no maintenance over their lifetime. Monitoring: Most solar leasing companies offer free online, smartphone, or tablet programs to track your solar panel system's performance. Buying the system: You can buy the solar panel system at any time during the lease term at the price defined in your contract or its fair market value, whichever is higher. Selling your home: If you sell your property, you can transfer the remainder of your lease to the homebuyer or buy the system from your leasing company yourself and include it in the sale of your property. At the end of the term: When your agreement ends, you can either buy the system outright, have the leasing company remove it, or leave the system in place and renew the agreement with the owner. 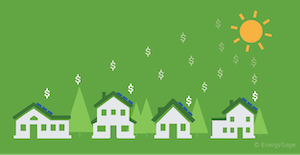 While solar leases and PPAs are commonly offered as $0-down agreements, you may also encounter custom down payment or prepaid options as you shop for solar. Learn more about commonly offered solar lease/PPA structures, as well as the solar energy advantages and disadvantages.